The Belfry Group is a major British facility management and building services operator. The company has developed a groundbreaking heating system – EcoPod – combining e.g. cascade boilers, biomass, heat pumps and solar panels. 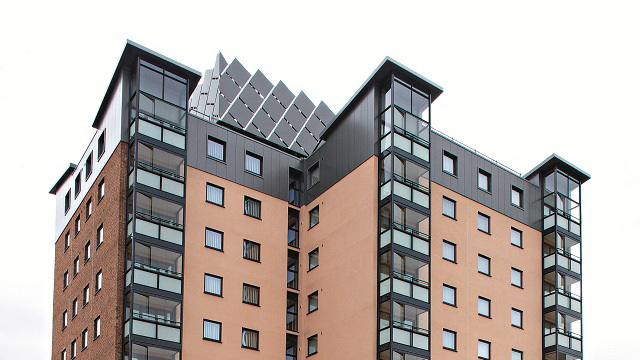 The substation Mini City Indirect from Alfa Laval has a key function in this system, which is now being installed to address fuel poverty within a flagship regeneration project (Barton Village) in the city of Manchester. or the whole apartment insufficiently. This caused damage by damp and mould. Keith Rimmer is the Managing Director of the Belfry Group. He describes the partnership with Alfa Laval as a joint development effort. “As part of our commitment to tackling fuel poverty, we are constantly developing EcoPod to see what aspects we can fine tune to deliver even more efficiencies and savings in the future. Alfa Laval plays a key role in that process, to the extent that they have access to our R&D facility in Warrington and we can draw on their R&D resources in Sweden”. Keith Rimmer also accentuates the importance of the substation for the efficiency of the system as a whole. “We’ve worked closely with Alfa Laval from the outset on EcoPod. They provide the key interface with the end user so it’s vitally important from our point of view that this part of the system is right, because it’s the bit everyone sees”. Keith Rimmer concludes by summarizing the partnership with Alfa Laval in a longterm perspective. David Green, Channel Manager at Alfa Laval in the UK, has been involved in the Barton Village project from the very beginning and describes it as something of a “model application” for Mini City. Mini City offers this. Compact dimensions and simple installation are other crucial factors”.